I was delighted to see these swans on the river close to my home. A mother and toddler were feeding them bread, and I didn’t have the heart to tell them it’s not a good idea. There were black swans in Aotearoa at the time of the first human settlement, but they had disappeared by the time Pakeha started to settle. 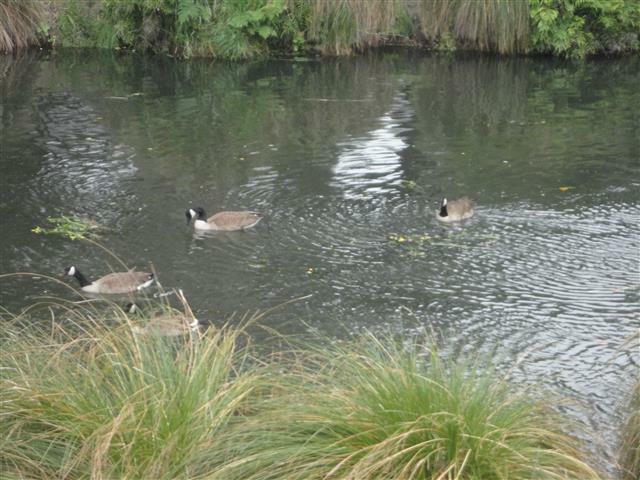 They were reintroduced from Melbourne as a game bird in the 1860s, and they regularly fly here from Australia. In the 19th century 40 black swans were imported to control watercress on the Avon Otakaro River, but they all flew off to settle elsewhere. I saw one last year near the Margaret Mahy playground, but haven’t seen them in the Avon Loop in recent years, so it was good to see this pair today. I often see Canada Geese on the river, but over the years I’ve never seen a Canada Gosling, and I wonder why. Do you know? Have any of my readers seen a Canada Gosling? Two ducks were strolling down the side path when Stephen opened the bathroom window this morning. I grabbed my camera and found them checking out the back garden. They communicated the fact that they expected breakfast and, lacking suitable grain, we fed them bread hoping their stomachs were mature enough for this not to harm them. Ms Duck had a quick dip in the pool, and after another inspection of the garden they flew away. 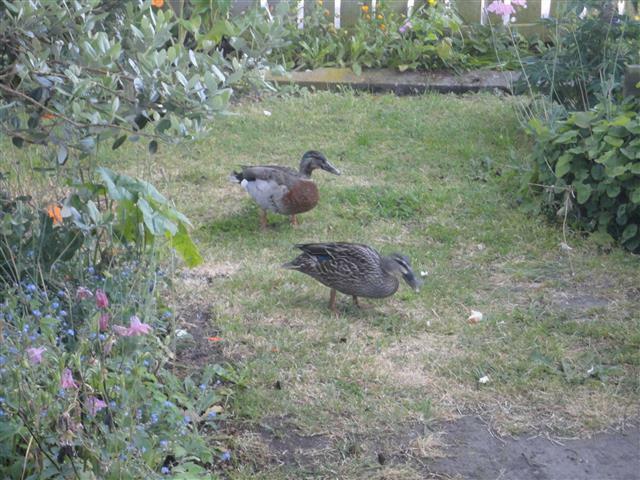 It’s nearly seven years since we last had a duck visitation, and more would be welcome (provided they have good toilet manners). 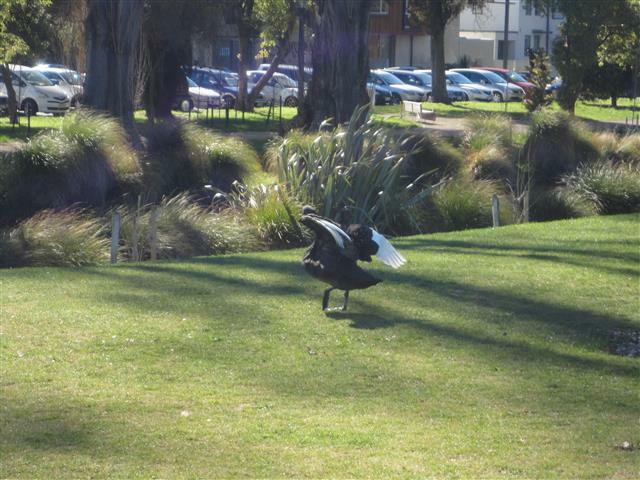 The black swan was at the Margaret Mahy playground again today. This time it was on the grass, and as I watched it spread its wings. This made me think of the Tai Chi move ‘White Crane Spreads its Wings’. 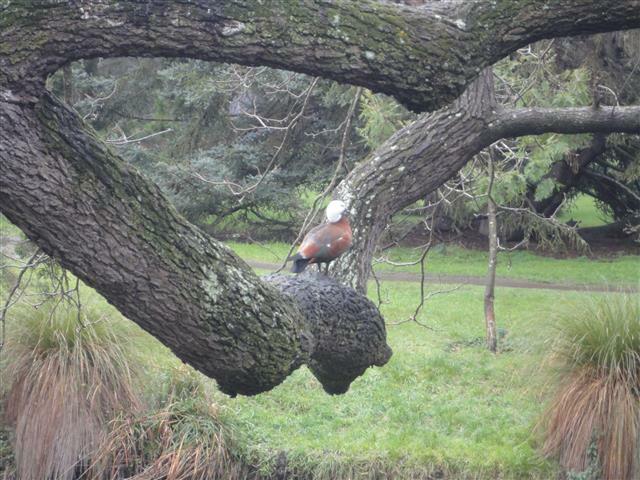 A lone paradise shellduck was sitting on a tree by the river this morning. Where is her mate, I wonder? They mate for life, so I hope he’s not far away.